1. Heat oven to 350 F. In large bowl, combine seasoning ingredients; press half the seasoning evenly into surface of Beef roast. Add oil to remaining seasoning; add vegetables, tossing to coat. 2. Place roast, fat side up, on rack in shallow roasting pan. Insert ovenproof meat thermometer so tip is centered in thickest part of Beef, not resting in fat. Arrange vegetables around roast. Do not add water or cover. Roast 1-3/4 hours for medium-rare; 2 hours for medium doneness. Roast vegetables 1-1/2 hours or until tender. 4. Carve into slices; serve with vegetables. 6 to 8 servings. 1. 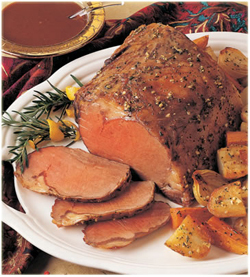 Heat oven to 350 F. Combine seasoning ingredients; press evenly into surface of Beef roast. Place roast, fat side up, in shallow roasting pan. Insert ovenproof meat thermometer so tip is centered in thickest part of Beef, not touching bone or resting in fat. Do not add water or cover. 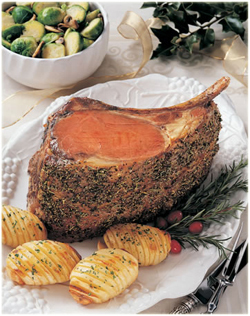 Roast 2-1/4 to 2-1/2 hours for medium-rare; 2-3/4 to 3 hours for medium doneness. 2. Remove roast when meat thermometer registers 135 F for medium-rare, 150 F for medium. Let stand 15 minutes. (Temperature will continue to rise to 145 F for medium-rare, 160 F for medium.) Carve into slices. 8 to 10 servings. Go to "Beef. It's What's For Dinner!"